Homemade Chocolate Ice Cream with bits of fudge and brownie inside. This recipe will rock your world! This week our theme for Sunday Supper is comfort food. We have a very special guest joining us this week. The talented Lee Woodruff joins our group for this week’s Sunday Supper. Lee is an author, CBS This Morning Contributor, founder of ReMind.org, blogger, wife and mother. She is also a foodie, so the group was thrilled when we heard she would be joining us this week. A huge welcome to Lee, hope you enjoy your time with the Sunday Supper crew. For me comfort food comes in many forms. Some days I want a big plate of lasagna, or a tasty roast chicken with all the trimmings. Other days I may crave a hearty stew or soup. This week my craving for comfort food came in the form of ice cream. I mean it is, after all, Sunday. So combining Sunday Supper with my Ice Cream Sundays just seemed natural. When I really want a big bowl of comfort the first thing I think of is chocolate. The second thing I think of is chocolate ice cream. The third is chocolate brownies, and the fourth is chocolate fudge. So obviously combining all these chocolate things together came to mind. I’ve done a version of this before with pistachios and it is by far my favourite ice cream on the face of the planet. I figured some folks don’t like pistachios (gasps in horror! ), so I decided to whip up a batch without them. Let me just say this is just a big old bowl of comfort you will not want to put down. You may keep going back for more. Seconds, then thirds, then your hubs might put a lock on the freezer to keep you from making a fourth trip. Next thing you know you’ll be standing by the freezer, bolt cutters in hand, trying to sneak another bowl without waking anyone up. You may drop the bolt cutters when you take that first bite. The rest of the household might wake up and catch you in the act. Someone may have taken a picture of you standing there in your horsey p.j.’s with chocolate all over your face. They may even threaten to put the photo on facebook. You may have to drain your bank account in order to keep that photo from surfacing. But it will all be worth it. This ice cream is THAT good. Besides this is all just speculation. Nothing like that would ever happen. I mean who would do such a thing. 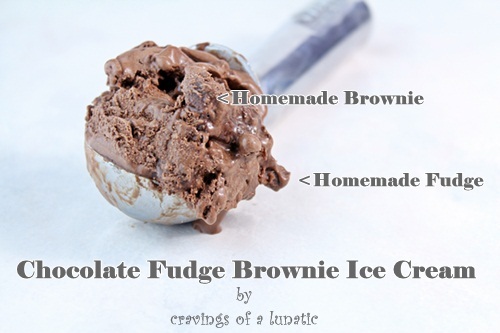 *hides photo behind her back..
A wonderfully easy, no egg recipe, to make Chocolate Fudge Brownie Ice Cream at home! In a stand mixer combine cocoa powder, both sugars, salt and whole milk. Mix until the sugars dissolve. Add heavy cream and vanilla and mix until fluffy, should be the consistency of pudding. Cover and stick in the fridge for a minimum of 1 hour. You can even leave it overnight, it helps the flavour to let it age a bit. Remove from fridge and transfer the liquid to a FROZEN ice cream maker bowl. Place bowl on your ice cream machine and turn on. Let it churn for about 5 to 10 minutes. You want it just starting to thicken before you add the other ingredients. Remove the bowl from the machine and hand mix your brownie pieces and fudge pieces into the ice cream. Cover again and place in the freezer until it sets. Remove from freezer about 5 or so minutes before serving. Serve with a big old "I do not have bolt cutters behind my back" smile! If you would like to use regular salt in this recipe that is perfectly okay. I just like the flavour the vanilla salt adds. You could also use vanilla sugar and vanilla brown sugar if you feel like playing around with the recipe a bit. All the recipes can be found on my blog. I am a bit of a vanilla nut. I even have a recipe for vanilla oats. It’s like a sickness or something. I need a vanilla intervention. Some vanilla therapy. I made my own brownies which are aptly titled The Best Brownies in the World. Seriously, they really are the best brownies I’ve ever had. I also made my own fudge. The recipe will up on the blog tomorrow. I think someone might have eaten it all so I did not get to photograph it. I have NO idea who did that. I mean NO idea at all. Who would eat a whole batch of fudge in one sitting. Feel free to use store-bought brownies and fudge if you wish. No judgement here. I know us foodies like to go on and on about how homemade is always better and blah, blah, blah. But let’s be honest here folks, you are stuffing it inside ice cream so no one is going to know if it’s homemade or not. Just make sure you hide the packaging and no one will ever know. Well, except me. But we’re buds and I promise I won’t tell a soul. Wait till you see the comfort food recipes our talented Sunday Supper Contributors will be featuring. Just look at the gorgeous recipes! I love ice cream with soft biscuit pieces in it. On my last day in Italy, I had a biscuit ice cream that made me swoon. There’s just something about soft morsels in ice cream. I wish I had gone with you to Italy. Going to stop by your blog tomorrow to read about it. I am so behind with the new part time job and hubs out of town. I feel like a bad blogger lately. 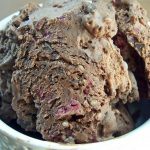 Oh, this is a loaded chocolate ice cream and it looks fantastic! My chocolate cravings go in pretty much the same order as yours, and I love pistachios, so this recipe will be made with them! Thanks. Glad to know I’m not alone in my cravings. Chocolate ranks super high. I’ll try to update the photo for the old recipe and repost it. It’s divine. But it was part of the g+ accident if I’m not mistaken and has no photos. Ugh. Lol Uru. You crack me up. You would LOVE this one. If I could lick my screen right now, I would!!! YUM!!! If I had a nickel for every time I’ve done that at your blog…. I would hide this ice cream in the freezer in the basement and eat it when my husband is at work. Selfish? Why yes. But that’s okay with something this heavenly. I fell down laughing at your comment. Selfish, why yes. I am dying. 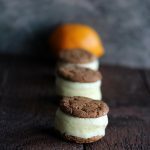 Brownie + Ice cream – Oh yes! That looks incredible, Kim! Rich and comforting. great recipe! Thanks so much. I just go crazy for all things chocolate. It’s so indulgent but I just cannot help myself. I lost my mind at vanilla salt. This is acceptable breakfast food, no? Lol, I know right. It’s freaking awesome. Picture it with fish. Like heaven. It totally is. And was. And will be again. These all look so delicious and comforting. I don’t know how to find this group on Twitter let alone understand all the rules with Twitter and #. Any chance you can direct me to a link of how to join in the conversation? Thanks Vicki. If you search #SundaySupper you should find us. We will be chatting at 7 pm EST and they are giving away 5 copies of Lee’s book. Does that help? If not, let me know and I’ll see if I can make sure you find us tonight. Thank you for your reply. I was working today and by the time I got home, made dinner, cleaned it up and got online I saw that it was already over by 45 minutes. I’ll know for the next time. Thanks for your post on my blog. Please check out my latest – I have a giveaway! Please enter! I shall try and breeze by tomorrow night. I am suppose to be snoozing up a storm right now cuz I gotta get up in about 5 hours. But I hate not replying to comments the day of the post. If that’s not comfort in a spoon, I don’t know what its, WOW! I’ll take two scoops! Dang, this looks GOOD!! I love ice cream with cookie bits in it – so I know I’d fall in love with this. 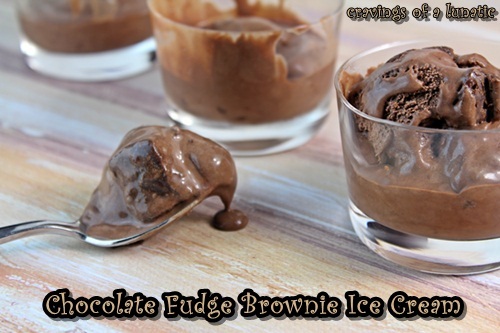 What a wonderful idea to have brownie bits in chocolate ice cream! It’s so good. Baskin Robbins makes a version and so does Ben & Jerry’s so I just had to jump in with my own. Cuz I like to make the big dogs quake in their boots like I’m gunning for them. Thanks so much. It’s so freaking addictive. Honestly I need to stop. It’s almost embarrassing. Hatleystore- best pj’s in the land. I have horsey ones and moose ones. Bought them in Banff. http://www.hatleystore.com/default.aspx? Holy moly…the brownie AND fudge chunks make this ice cream. want…some….now…. Thanks so much. it’s freaking good with the chunks in it. I want to lick my screen. I love chocolate ice cream and brownies. I am so glad you pu them together! Thanks Veronica. I love this combo. It’s lethal though. Can’t stop eating it. OH my this looks perfect for a midnight snack when I’m having a rough night. It is indeed, perfection in the middle of the night. And day. And afternoon. My chocoholic stepdaughter would LOVE this! You gotta make her some. I always feel bad posting sugar laden things you can’t have. Don’t feel bad! Just be happy you can enjoy it! Wow this is a chocolate lovers dream! Thanks for sharing! It really is. I am hoping to dream about it tonight. Then perhaps sleepwalk to the freezer. Oh my! what a delicious ice cream. This is wonderfully and ridiculously amazing! I need in my life. Like, pronto! Lol thanks. It is a tad over the top. Which is exactly how I roll. Glad you liked it. That is AWESOME that you have horsey pajamas! I knew you had great taste! 🙂 I like to eat ice cream in my pj’s by the fridge too and I know I would need a few bowls of this delicious sounding ice cream. The fact that it has brownie chunks in it puts this over the top! I know right. I also have moosey ones. I not only eat like an 8 year old, I sleep like one too. I love this ice cream. It screams childhood to me. Are you going to be packaging this up and sending it out for taste testing? Pretty sure you need to, and I will volunteer to help out. I shall try to save you a bowl. We’ll call it quality control. What do I get in return, something equally sinful I hope. Oh my lord, I am drooling!! I can see my daughter with her eyes rolling back eating this. She would love it. I will have to make it for her. Amazing!! Lol Tara, I am dying about the eyes rolling back. Can’t stop laughing. You gotta try this for her. I’m coming to live with you. This ice cream is calling my name, and I don’t think I’ll stop thinking about it until I get some. Pinned! Deal! It’s so decadent I almost feel bad eating it. Almost. Oh my stinking good gracious, this ice cream sounds like heaven! I eat ice cream or frozen yogurt every night for dessert (not kidding), and I would oh so very much like to have this flavor in my bow!!! It’s pretty over the top. Especially when I’m considering joining WW. I suppose it’s the right dessert to finally to finally push me over the edge to go join. Lol. Um hi ice cream. Hi chocolate. Hi fudge. Hi BROWNIES!? YOU ARE FORREALS INSANE AND I LOOOOVE IT!! Lol, it’s a tad on the naughty side. Santa may be scratching me off his list this year for this one. Nuttin’ better than chocolate ice cream! PS…I meant to email you this weekend…no pressure about Whipped…I know we’ll still meet some day if you decide not to go 🙂 But I will be super excited if you can make it. I’m hiring our mutual friend to move my blog…so wanted to chat with you about that, too. Hopefully soon! Thanks Liz. I made this one with pistachios in spring, it’s so good. But wanted a total chocolate explosion on this one. Yah to moving the blog. Hit me tomorrow evening. I am working in the morning then driving K to school and running errands while I’m in the city. But I’ll be home at night. I’m having my site revamped. Soup to nuts this time. So excited. I am considering going. I am just freaking out about the hour long drive to the hotel from airport. An hour without a loo is killer for a gal like me. Especially if I’m shuttling with other people. I need to look into options. I tried googling loo’s on the way but it thought I meant places to buy a toilet not use one. I almost died laughing when I saw that. You might have just made a chocolate believer out of me! Plus, it’s a great excuse to use my stand mixer! Amen sistah! It’s so good. I went all out and squeezed as much chocolatey goodness into this as I could. Don’t just love a reason to pull out the stand mixer. Mine sits on my counter whirring every single day. I’ll cry if it ever breaks. Are you taking orders? 😉 Sounds and looks amazing; I really need to get an ice cream maker to give it a try. Am looking forward to see the fudge recipe tomorrow. I should right. You should get one. I bet you could even just whir this up in a stand mixer and freeze it in a steel bowl. Can’t hurt to try. I will post that fudge recipe tomorrow night. I’m looking at a new light system in the afternoon so if I can get a good deal I may take new photos with it. I’m shooting for under $50. Cross fingers. Any chocolate ice cream stuffed with brownies is a total win in my book! Just hand me a spoon! Thanks Stephanie. I’ll hand you the biggest spoon in the joint I promise! OMG, I love that you made ICE CREAM!!! Ice cream is totally one of my comfort foods. . for sure. Ben & Jerry’s has gotten me through many nights. . 🙂 yours looks AMAZING! and I LOVE the shot with the ice cream scooper. YUM! Thanks so much Alice. I had the pleasure of meeting up with Ben & Jerry’s this summer. I got a tour and was so impressed with the crew. I am such a freak for ice cream. It’s oddly the one thing I can walk away from after one bowl. Which for me is huge. Awe thanks. I love hearing that. Hopefully one day we get to meet in person. We’ll go out for ice cream. But I’m not sharing. This is melting dream! I love ice cream and chocolate and this one is perfect! Thanks Katerina. Chocolate is my one true love. Well other than pistachios. And candy. And turtles. Okay so it’s like top 10. OMsuperG!!! Chocolate and more chocolate, that’s my kind of ice cream! I super love you! And ice cream. Wow this looks so amazing! Ice cream is the bomb 🙂 I almost have a little scoop every night and will definitely try this out. I love indulging a little bit every day. Stuff like this makes life worth living. Mine too. We should celebrate with a bowl of ice cream. I’m with you – comfort food is whatever will provide you comfort that day. It can be anything. If I were down and needed something to pick me up this ice cream would be my comfort food! Outside of that – it’s just yummy food! I like the way you think. We need to sit down and share ice cream together. If I can bring myself to share. I have to admit that I’m not a huge ice cream fan… this one however??? Wow! !, I mean WOW!! It looks absolutely awesome!! 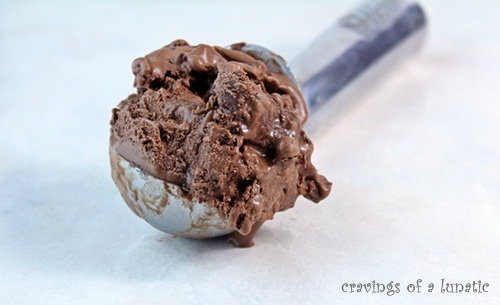 Chocolate + fudge + ice cream – you’re killing me! lol…great looking recipe. 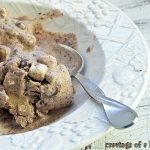 Ice cream is definitely a comfort food favorite! Thanks Martin. I love me some ice cream. I love ice cream and my children’s favorite is always chocolate. The brownie and fudge pieces into the ice cream already tells me this is a fantastic ice cream! Thanks so much Nami. I love bits of fun things in my ice cream. Just makes it more fun to eat. Your kids have good taste. Chocolate rocks. My boyfriend would totally hug you inappropriately for this. 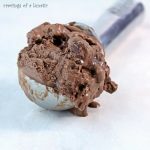 When I first started making ice cream earlier this year, I made a chocolate version that he has pretty much asked for every say since. But this! This had fudgy brownies in it… oh that totally ups the ante. Now I need to make room in the freezer to hid it. oh wow that ice cream look perfect! I am almost positive that it doesn’t get any better than this. Fudge chunks AND brownie chunks?? That is awesome! Thanks so much Chrissy. I got a little carried away. But it was totally worth it. This is one whoppin’ good lookin’ ice-cream! I wish I had a big ol’ scoop right now! I had to stop myself from lickin’ the screen! Thanks Ann. It was so good. This is my ultimate fave. Lol, your comment made me laugh. Chocolate, fudge and brownies in an ice-cream?? Oh my! I am craving choco fudge ice cream as well! Its so hot here, totally unbearable and since I don’t have the cold yet (as I thought I would get from my husband) I should dig in! You totally should. This would cure a cold I’m sure of it. Or at least make you not care you have one. It’s fall here, but the last couple of days have been pretty mild. Loving every minute of it before the cold and snow hits. So the other day we were driving to the MIL’s house and I was telling my finace how much I wanted an ice cream fudge sundae. He told me that Dairy Queen was closed for the sake of my diet. I want this instead now. Yummy! I cannot stop laughing. That’s something my hubs would say. I fell off my chair when I read that. I get tempted some days I swear. Too funny! Oooh, this looks comforting indeed…anything with all that chocolate is exactly what I want when I want comfort. Your first photo? Love it!! Ah ! Classic comfort food that everyone loves ! Love your homemade rich version ! Looks finger licking good ! Yummmmm ! Who doesn’t love a bowl of great chocolate ice cream. 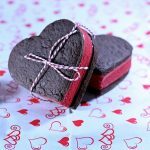 I love chocolate – period. And you didn’t save on the cream. That’s great. I love it. 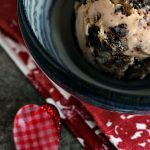 I love ice cream with chunks of stuff in it! I’m afraid if I make this we’ll eat the whole thing in one sitting! If fudge is not liked in the house (I KNOW. I KNOW!!). Is it possible to do all brownie pieces in lieu of the fudge?!? Yes, you can totally substitute. Nuts are great in it too if no one is allergic. Or cookie bits. Could you sub an entire cup of brownie pieces in lieu of fudge?! Two really strawberry cheesecake or pralines n cream yum. Omg!! Is this wonderful or what!!!! Delicious!! Shouldn’t be a problem at all. You can always mix up add-in’s for any of my ice cream recipes. Hope you like it. Oh man that brownie! Yummy! I gonna try bake it. Thanks, hope you love them. 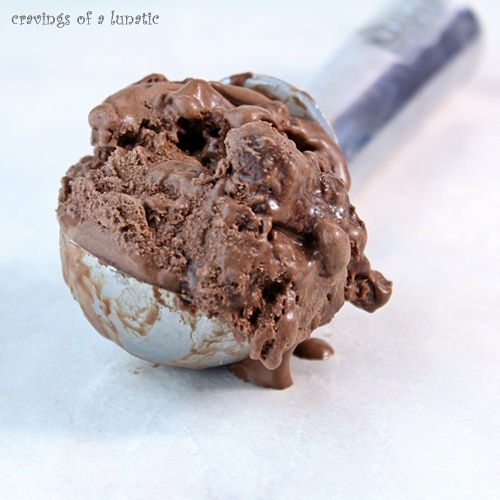 Chocolate fudge ice cream for the weekend!